SC: I want to welcome you all to another edition of Watch Out. This week I’m pleased to bring you author Julia Knight. Welcome to Watch Out, Julia, it is so great to have you here. JK: Thanks for having me. JK: I’m a British author of (mostly) fantasy with a strong leaning towards romance. I love action, excitement, adventure and a hero to fall for. JK: To be honest, I’m always surprised that I’m writing romance! I never set out to, but all my characters nudge me to say ‘Hey, I fancy the pants off of them, what are you going to do about it?’ lol. As for topics, they come from all over the place. Films, random conversation, places—the last manuscript I finished was influenced by my editor saying that my writing style might suit an historical. Two days later I was in the Norwegian fjords and a Viking just popped into my head to tell me his story. JK: I usually say that I’m bipolar, but my husband says me being an official loon surprised no one! So I’ll say that I’m a biker chick, leather jacket and all. Though my bipolar means I can’t ride any more – my particular diagnosis invalidates my insurance, sadly. JK: Immersing myself in a world and getting to know my characters. It keeps me off the streets and out of trouble. JK: One Hundred Years of Solitude. JK: Metallica. It usually is. JK: Both! Ebooks for the value and the sheer amount of books I can get through, paperback for my keepers. Although ebook purchases are easier to hide—I have to hide books from my husband like some women hide dresses! SC: One thing you have achieved as an author so far that you are very proud of? JK: Making my editor cry. That may sound a bit odd, but I was proud of the fact she loved a character so much that events in the story made her cry. Not just her either, if my emails are anything to go by. I love provoking an emotional reaction. For me, that’s what writing is all about—how you make the reader feel. Knowing that you’ve done that is a great feeling. SC: What is your cure for writers block? JK: Write it anyway. Even if it’s a load of tosh, the act of writing unblocks it all and then I can get on with the real story. SC: Procrastination happens to the best of us…What is your guilty pleasure when you procrastinate? JK: I play a lot of World of Warcraft. Too much probably. I try to be strict and only play when I’ve got my words in for the day. Some days that’s easier than others. JK: Ooh, I’m not sure. Anything I say sounds like I’m saying other authors don’t! I think I’d like to say my characters, and that my romance doesn’t usually follow the normal path. Van Gast leapt off the ship before the gangplank had reached the jetty, ignoring a shout of protest behind him. For the first time in maybe ever he was glad to be ashore rather than afloat, back among people and places he knew instead of on a ship crewed by ex-slaves who were having trouble adapting to freedom, their minds still bound by a life-long habit. Their vacant stares, their clockwork numbness, made him itch. The time spent getting here had been torture, a thumb-screw of bed-rest, a spike of boredom, a hot brand of greyness, of sameness. He wanted colour and noise and excitement. He wanted to get these grey Remorian clothes off and find a really bright shirt, some garish breeches that fitted snugly and a pair of boots he could hide his knives in. He wanted to be Van Gast again, the most renowned racketeer along the western coast, the rack, the one they all wanted to beat. He wanted to run from guards with a fizz of fear and joy in his blood, to con and steal and twist till his pockets ran with money and then spend it all on booze and gambling. He wanted things as they had been before, to take the stupid-but-exciting over the sensible-but-dull, always. JK: First get it written, then get it right. Julia thank you again for being my guest on Watch Out. I loved the answers to the interview. I wish you all the best. I just did a blogfest yesterday about games. I think 2/3’s of the people wasi WoW was their number one choice. Great art. Good luck with your new release! Congrats on the book, Julia. Sounds awesome. Great interview. 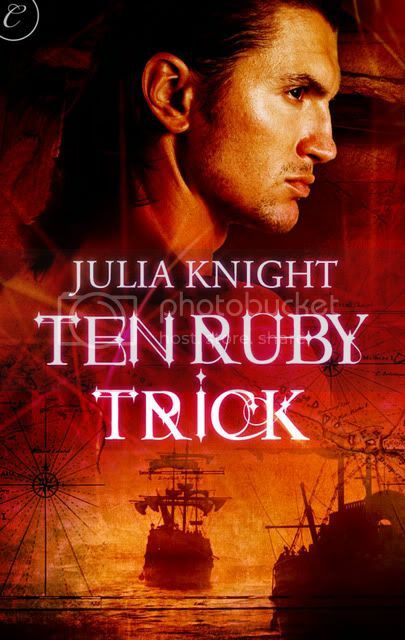 Wow, Ten Ruby Trick sounds awesome – and like it would keep me up all night (in the best way, of course). Julia sounds like a Renaissance Woman, just the kind of person I like to emulate. Savannah, thanks for bringing Julia to us! Thanks for a great interview , as always, Savannah. Julia, great to meet you , and your cover is really hot. I love the choice of font, and the pirate…well…he’s pretty hot too! Hi Julia! I love your cover, too. And I agree, in the case of writer’s block…write anyway. Great interview. Love the cover, title and the premise of this book! Also, gotta love a fellow RPG gamer author who jams to Metallica. Thanks Savannah for introducing a new-to-me author and another book to add to my reading list! Tatiana thank you for your support for Watch Out and Julia….